Last week, I somehow found myself heavily dependent upon bread. Breakfast was two slices of toast with nut butter, and while running around town we picked up sandwiches. In the past I have treated wheat like what it is, a single ingredient. As my own personal rule, I don’t like to have more than two servings a day of a single food, and I like to keep things varied, rotating between meals throughout the week. But with a busier than usual schedule, I reached for more convenience, and it made me realize just how reliant our culture is on wheat. I believe I’m the only one in the 30 Days to Easy Gluten-Free Living event who isn’t strictly gluten-free. 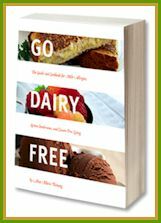 But, I followed this “easily” process to create my own strictly dairy-free life, and believe it or not (last week being the exception! ), I do eat gluten-free by choice for most of the week. The fact is, the very concept of gluten-free living has enabled me to think outside of the bread box and expand on my diet. Yes, you heard me correctly. Removing what we often think of as a “food group” can actually help you to diversify your diet! Wheat out, but more foods in … more options definitely makes things easier, don’t you think? So as I embark on my cleanse, moving myself away from a heavy reliance upon bread and gluten in general, I want to share just a few of these naturally gluten-free bread and tortilla alternatives that I have discovered over the years. Sure, it takes some thought, beyond picking up a regular sandwich, but healthier eating in general requires at least a little planning, don’t you think? Lettuce – This is more awesome than you may realize. Lettuce wraps are popular on Asian restaurant menus, but they can wrap up so many other foods with ease. Plus, a lettuce leaf is so much lower in carbohydrates, sugars, calories, and fat than bread, leaving you more room to enjoy ample filling (the best part in my opinion!) and also preventing that horrible belly bloat. Collard Leaves – Collard greens are surprisingly rich in non-dairy calcium and other vitamins and minerals, but in terms of replacing tortillas, they are also extremely sturdy. I cut out the tough stem in the middle, and use the two leaf halves to rolls up some flavorful goodies. Since Collards (and other greens for that matter) can be a bit bitter, I prefer to use bolder fillings. You may wish to do this too if bitter isn’t one of your favorite tastes. Nori – You don’t have to love sushi to appreciate this awesome seaweed. I’ve been known to roll all types of leftovers into nori wraps … from teriyaki chicken to roasted vegetables to tuna salad. 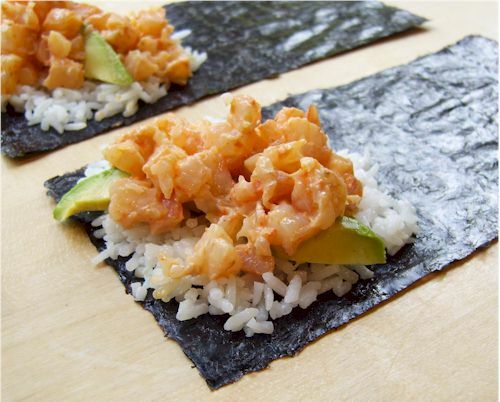 You can even stick to simple veggie fillings for a light nori roll snack. I buy them in bulk on Amazon (I’m not brand loyal for nori), where they are immensely cheaper than in stores. Okay, so those are my ideas, but please do share … What are your favorite ways to sandwich or wrap up a delicious filling? 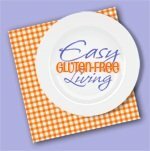 Here’s the list of the 30 bloggers and the days that they’ll be sharing their easy gluten-free living tips and recipes! Great tips, I also enjoy using portabella mushrooms especially for burgers! Yum! I haven’t had portabellas in far too long. These are great especially for someone working to get more sea vegetables into their diet. I just love the ideas here. All great solutions, Alisa! I am attempting tortillas made using coconut flour this evening for my support group’s belated Cinqo de Mayo celebration. It’s a recipe from Mark’s Daily Apple. I’m also a big fan of using chips as a bread alternative. Whenever I make my homemade Sloppy Joe’s, hubby has his on a gluten-full bun and I have a few tortilla chips or potato chips with mine. And remember when we were in CO and the barbecue place used a baked potato as a naturally gluten-free delivery method. That was so good! You told us about your potato slabs at the time and how nicely those work with barbecue on top. Wonderful post, Alisa! I especially like your point on how eliminating one type of product opens up the door for variety and fun. It’s so true! Leave it to me to forget one of my own sandwich mediums! Thanks for reminding me about my own potato planks Shirley – I forgot to include that one! Yes, that BBQ place was awesome, and I did love the potato – another good idea. Tortilla chips are a great idea too, and a fun way to eat the filling. Fantastic post Alisa! I am the queen of lettuce wraps (need to try with meatballs though, looks yummy) and we have come to love socca. Its never occurred to me though to use collards and other greens (or even sushi wraps) to hold sandwich fillings, but I will definitely be trying this soon! This is such a great post! The other thing I have found since being gluten free, is that you can usually get restaurants to give you a sandwich or wrap on a salad instead. Its one of my favorite things to do when eating out. The meatball boats look great. Mmm, yes, love me some salad. A couple of years ago I was on a veggie burger salad kick. Made one for lunch almost every day. Great post! I’m not sure I’ve thought about it but there are a lot of ways to “work around” a typical bread food vehicle. You can even stuff veggies or roll hummus and veggies in sliced meat. I love your ideas here. And now that the weather is warming up, I know I could use some fresh, and less heavy, alternatives. Awesome ideas Alisa! We’re actually eating Kelly’s wraps for lunch! They are so easy to make and so tasty. I love them. We do the collard wrap thing a lot too. And we’re big fans of crackers 🙂 Food For Life makes a good rice wrap that we use too. I have only fairly recently embraced wraps as part of my gluten-free diet. 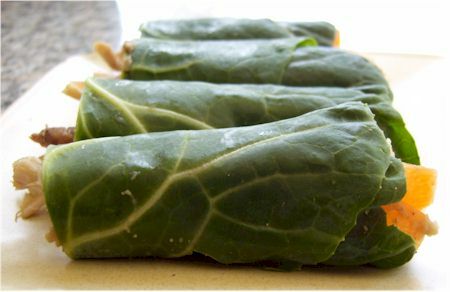 I love using collards – yum – and I’ve made Kelli’s recipe for her grain-free wraps. Also yum. 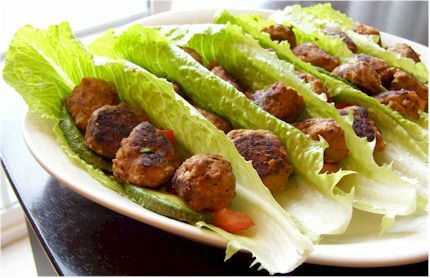 My husband LOVES lettuce wraps – I don’t make them enough – but I’ve never done meatballs. What a great idea! Ooh, I’ve done potato vessels (definitely yummy), but pepper boats, that is a new one! What a great idea Julie. Great suggestions! I LOVE lettuce wraps. They are a family favorite stuffed with fried rice! YUM! I’m making socca tonight. I have to say of all the gluten free bread options, that one is my favorite. These are some great ideas that I hadn’t thought about. The GF bread is so expensive, and the last thing I have time for is making my own. But these other alternatives sound so easy. And, I can’t wait to try the socca. Had no idea how easy it was. Great ideas! 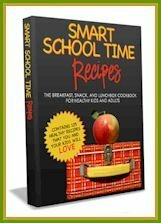 I love how you stress all of the possibilities instead of the limits in special diets! You’ve got me thinking about dinner tonight. Hmmm…. Wonderful ideas! The Socca wrap sounds intriguing! When I read posts like this, I wonder why I was stuck on wheat wraps for most of my life. There are so many other options! You know I LOVE lettuce wraps! And I have no idea how this is possible but I have never heard of socca before and t looks so delicious and easy. I will definitely be trying that this week – my mind is spinning with endless possibilities. wow, what a great post! thank you again so much for including us. 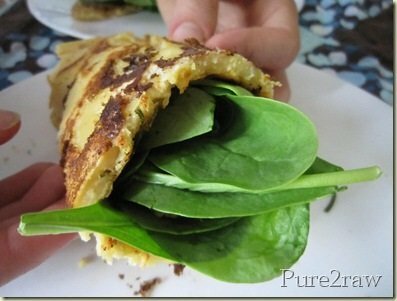 love making wraps with swiss chard and collards! How did I not know about socca??? I can’t believe that’s a new one for me. I’ve made chickpea type tortillas before, but not like this and I never knew they had a name. I love using collard greens as wraps. I quickly blanch and cool them to eliminate the “rubber glove” texture. I love nori and Napa cabbage boats. Great post, Alisa. We need more bread alternatives and you gave us a bunch! Love this! I actually didn’t love socca Melissa, but thinner and in a wrap format works for me. When made thicker, it is just a bit too dense, you know? 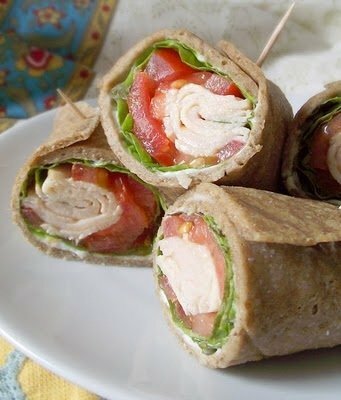 Terrific ideas for gluten-free wraps, must try a bunch of those! Alisa, would you mind sharing your meatballs recipe? I’ve been on the hunt for a good meatball recipe and I would love to try yours. It’s a pretty simple recipe actually, but if I can find my notes again, I will post Cristine!